Houzz Editorial Staff. Writing about the cost of renovation and what it takes to remodel. Former Forbes real estate reporter. Fascinated by cool homes, watching the bottom line. Click "Embed" to display an article on your own website or blog. 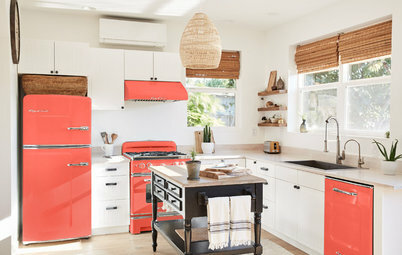 Many homeowners are choosing hardworking materials and neutral color palettes for their renovated kitchens, according to the 2019 U.S. Houzz Kitchen Trends Study. 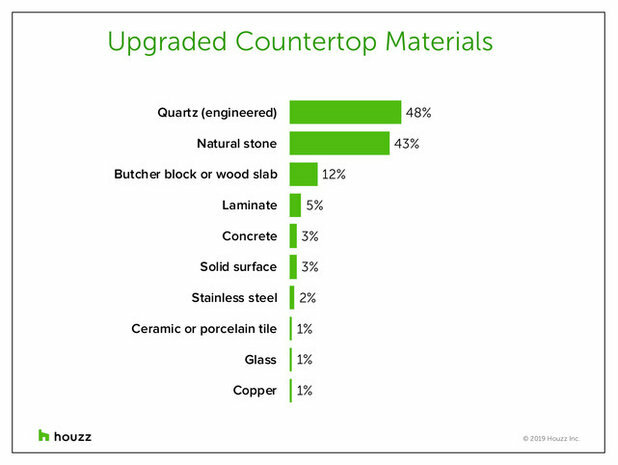 Quartz counters have overtaken natural stone as the top choice for upgraded counters, and engineered materials are now ahead of traditional hardwood for floors, the study shows. 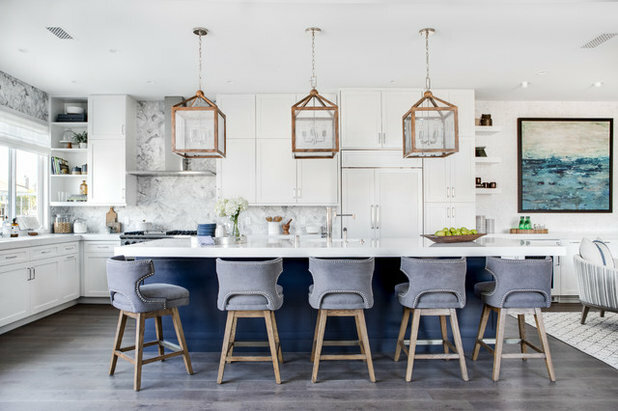 Read on to find out about top kitchen renovation trends for counters and backsplashes, as well as floors, appliances and walls. 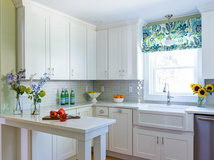 White quartz, pictured here, is the most popular material and color for counters in renovated kitchens. 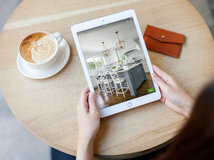 The 2019 U.S. Houzz Kitchen Trends Study gathered information from more than 1,300 Houzz users who had completed a kitchen remodel or addition project in the previous 12 months, were working on one, or planned to start one in the next three months. Countertops are the No. 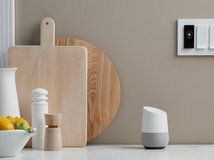 1 feature to upgrade as part of a kitchen renovation, with 93 percent of renovating homeowners upgrading this element, the study found. 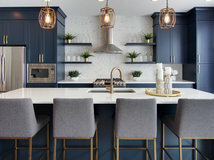 Backsplashes are the second-most popular feature (87 percent), followed by sinks (85 percent), faucets and plumbing fixtures (83 percent), light fixtures (80 percent) and cabinets (78 percent). 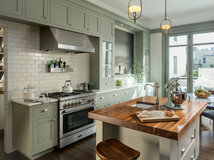 A smaller share of renovating homeowners (35 percent) are enlarging their kitchens compared with the year before (41 percent). 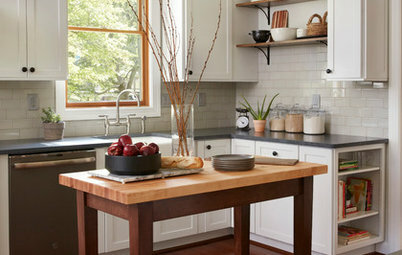 White quartz counters are a calming neutral that allow a gray marble backsplash to shine in this kitchen. 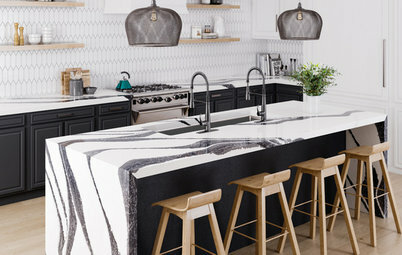 For the first time since Houzz began tracking the data four years ago, engineered quartz —favored by 48 percent of renovating homeowners who upgrade their countertops — is more popular than natural stone (43 percent). 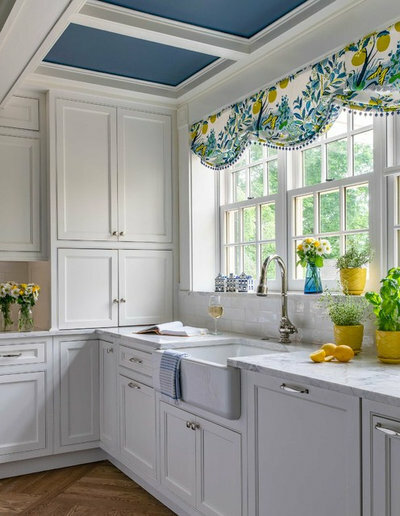 Granite in particular has declined in popularity: 40 percent of renovating homeowners upgrading their counters chose this material two years ago, compared with the 30 percent who are choosing it now. 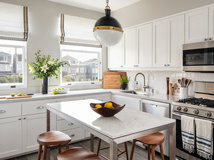 White countertops continue to gain fans, with nearly 1 in 3 upgraded counters (31 percent) done in various shades of white. 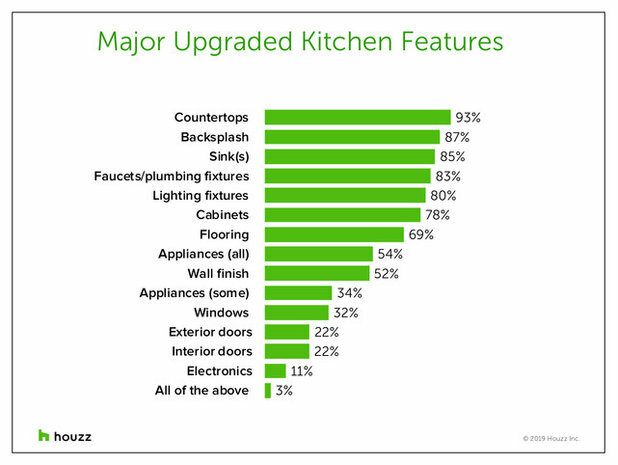 Multicolored counters are the second pick (26 percent) among those upgrading counters, followed by gray (13 percent). 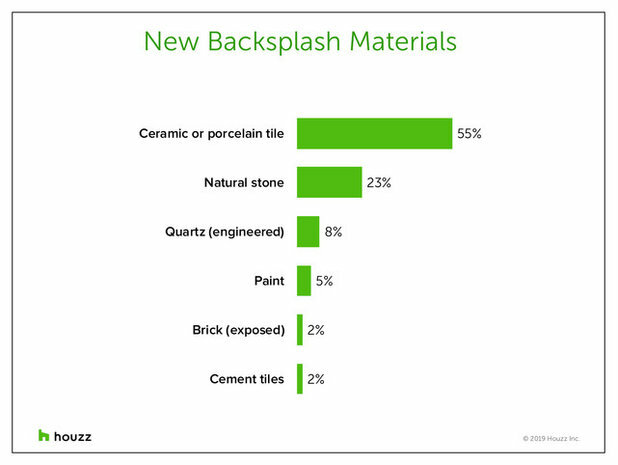 More than half of homeowners upgrading their backsplashes prefer the brick pattern, as seen in this photo. 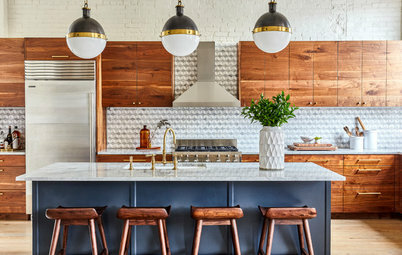 The most popular pattern for new backsplash tile is the classic brick pattern (54 percent), in which tiles are laid in an offset pattern in alternating rows, as on a brick wall. (See previous photo.) 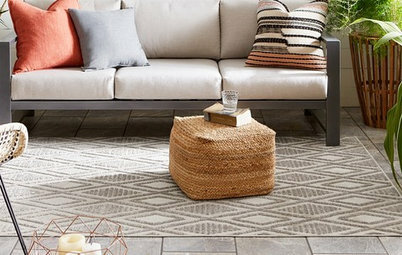 Classic herringbone (9 percent) is the second-most popular style, followed by the grid pattern (7 percent), in which the grout runs in straight lines vertically and horizontally. 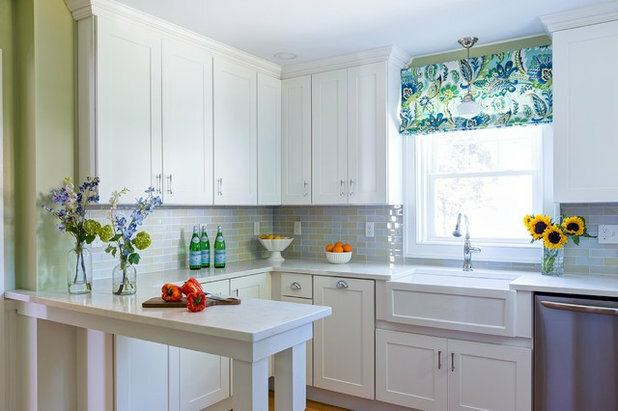 More than one-third (35 percent) of renovating homeowners installing new backsplashes are choosing various shades of white for this feature. 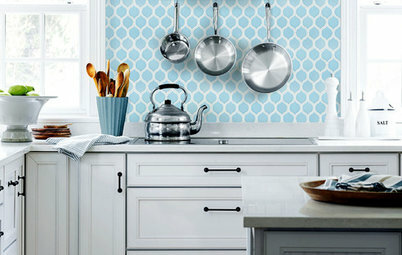 Twenty percent are choosing multicolored backsplashes, and 14 percent are selecting gray. 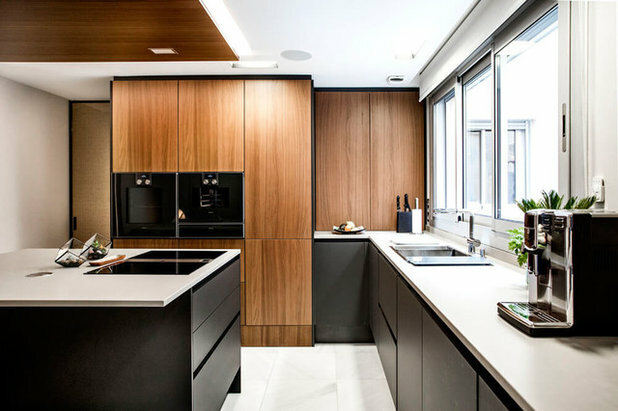 Black appliances add to the sleek look of this contemporary kitchen. 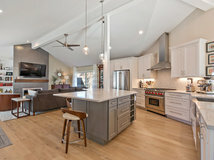 Among the 69 percent of renovating homeowners who are upgrading their kitchen floors, ceramic or porcelain tile is the top choice (26 percent). 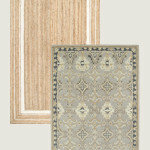 Hardwood flooring has declined in popularity over the years (24 percent now compared with 32 percent two years ago). 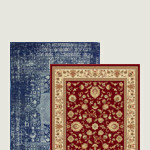 Meanwhile, engineered flooring has collectively become more common, with 17 percent choosing engineered wood, 12 percent choosing vinyl or resilient flooring and 11 percent choosing laminate. Stainless steel remains the most popular finish for new appliances, selected by 69 percent of those upgrading their kitchens. 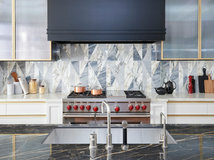 But black stainless steel is rising in popularity: 10 percent of renovating homeowners upgrading their kitchens are choosing a black stainless finish for their renovated kitchens. 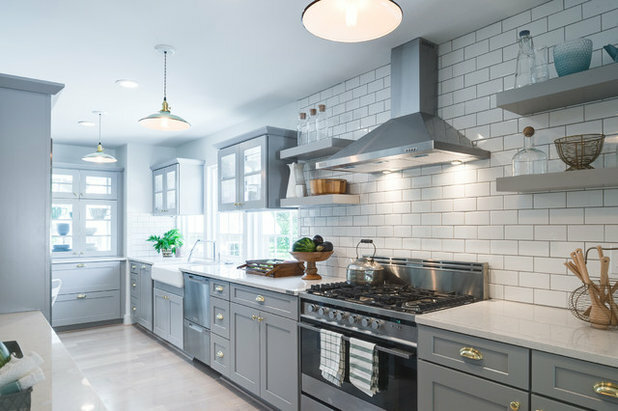 Gray is the most popular color for kitchen walls, chosen by 31 percent of renovating homeowners who are upgrading their kitchens. White was second (24 percent), followed by beige (19 percent). 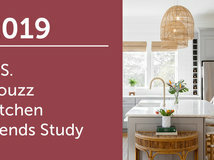 The 2019 U.S. Houzz Kitchen Trends Study gathered information from 1,337 Houzz users who had completed a kitchen remodel or addition project in the previous 12 months, were currently working on one or were planning to start one in the next three months. The study was fielded between Sept. 18 and Oct. 19, 2018. How long do you wait before taking over a kid's bedroom? 12"x12" Carrara White Grand Brick Subway Mosaic Tile Polished, Chip Size: 2"x4"
@Douglas M - with you all the way! Granite is an ugly stone, always was, always will be. Hang practicality if every site of your benchtop makes you want to gag. 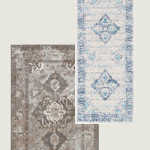 Also, grey mania - bleh! 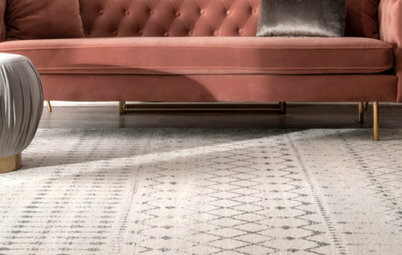 Like most "on trend" colours it gets overused in inappropriate settings and that is what contributes to a colour becoming "dated". We need to bring back Burnt Orange, Avocado, Harvest Gold ! ! ! I hate stainless appliances as well. I couldn't afford granite (or the recycled glass countertops we wanted) when we had to redo our kitchen but I WANTED formica since I couldn't afford the recycled glass! So many fun colors, styles. People think I'm nuts but my spouse agreed. 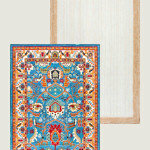 I also love sheet vinyl although now they try to make it look like ceramic or tile or wood. And thankfully white appliances are cheaper cos I wouldn't go any other way unless I could afford the fun avocado or harvest gold. I had a pink fridge growing up! People, people, people enjoy your space, have fun with it. 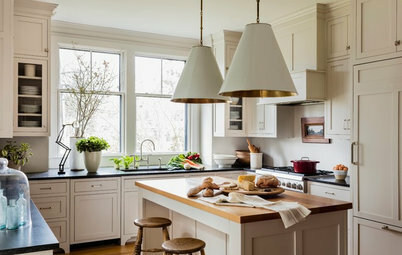 If you smile when you see your white cabinets, stainless appliances and granite countertops in shades of gray good for you but don't do it cos you think it's "in" and will sell better. Even if you sell in 5 years, it's gonna be considered OLD. 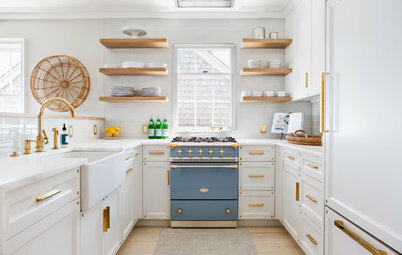 Colorful Kitchens Are Colorful Kitchen Appliances the Next Big Trend?